Do you feel like your bathroom needs a makeover? Or simply something new to make it more interesting? Whatever the reason is, adding or updating your current vanity mirror will do wonders. It may not be on the top of your list but it is such a useful tool that a bathroom will not be complete without it. A vanity mirror can brighten things up and create the illusion of having more space, which is very important especially in small bathrooms. Identify the space where you want the install it. 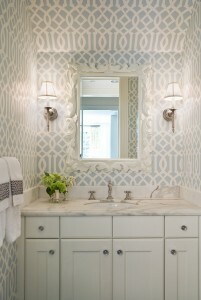 Vanity mirrors come in all sorts of shapes, sizes, and designs, but the available space will play a role in what to buy. If your bathroom has a wide, bare wall, you can install a large mirror. If you have limited space, you may opt for one with extendable or collapsible arms. Think about lighting. It is best to install your vanity mirror somewhere with good lighting – that means a daylight/natural light setting. If possible, allot the space near the window for your vanity mirror. Natural light may not be that helpful when checking your make-up imperfections, but it will let you know exactly what you look like when you step out of your house. Light bulbs can also be installed in vanity mirrors. Opt for white light. Choose the right type of mirror. Here are some of the common types of vanity mirrors: frameless, framed, Venetian, medicine cabinet mirrors, illuminated, pivot, fog-free, and extension or swing-arm. It all depends on how much space you have and how you intend to use it. Go for clear, distortion-free mirrors. When it comes to personal care – grooming, applying make-up, and doing your beauty regimen – having a vanity mirror with powerful magnification is essential. Check the design. After ticking off the “functionality” aspect, it is likewise important to ensure that the vanity mirror you’re eyeing has a design that suits the current style of your bathroom. Unless you intend to do a bathroom overhaul, make sure that your mirror will not look out-of-place in the existing overall look and feel of the area. How much are you willing to spend?Budget obviously plays a big role when it comes to buying vanity mirrors. In general, go for functionality over the aesthetics. The good thing is, most mirrors available in the market nowadays are created with both functionality and design in mind. Keep these tips in mind when buying a vanity mirror for your bathroom. Take note that you will be using it every day, and it is most likely the first thing the visitors of your house will look at when they go to the bathroom, so it is important to buy one that not only is functional but visually appealing as well.